Select in-stock or special order to find laminate counter options. 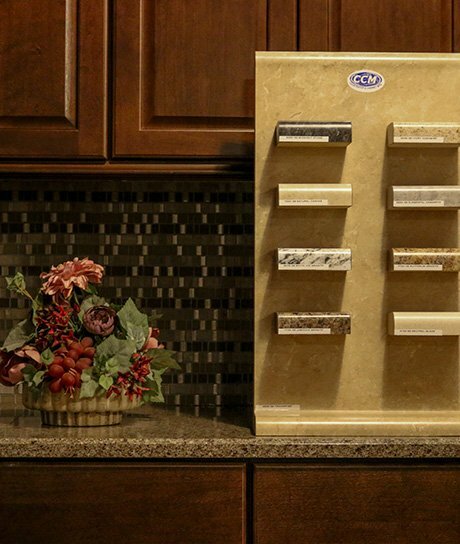 Farah’s has a huge selection of counter top’s in-stock and samples that we can order just for you! Laminate is affordable and versatile. A great choice for any kitchen or bathroom remodeling project. You’ll find any most any style, color, wood grain or pattern imaginable in our Wichita, KS showroom. Laminate Countertops clean with mild soap and water and resists stains. In addition to many patterns, your counters can have a unique style and accents to match your kitchen including a variety of decorative edges. We carry top brands such as Formica and Wilsonart, as well as many closeout and special offer brands. Call 316-263-1649 For Pricing and Availability or visit our Specials & Offers page to view our currently discounted items! © 2019 Farhas Carpet & Building Supplies.